How did you get involved with VMX Trevor? I’d been looking for a while and brought 2 bikes 15 years ago. Since that purchase, I’ve been doing Enduros. I’ve also been a member of the Aerial Club at Rowe St East Perth around 1961. And what race meeting would you like to attend while cashed up? Hawkstone or a Sidecar grass Track in the UK. As its pre70 feature today what make of that era would you ride and why? Victor it’s a nice bike and being brought up in that era I have fond memories. What do you enjoy about VMXWA race meetings? I attend Wandering to watch and I needed to get one. Just caught the bug, it’s hard to explain! Scariest moment? 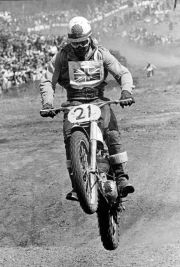 I’ve had a couple of hospital visits, one being rider error in a right-hander and flipping the sidecar at was at Noble Falls in 1976. Best Success? Waiting for it! Scariest moment? Car & Trailer from Kelmscott!